As we approach year's end in 2011, it gives us time to reflect and see the incredible strides that GFDD has made in fostering progress, collaboration and exchange in the greater Dominican community and with those interested in the richness and vitality of the Dominican culture. 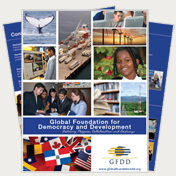 The new GFDD Brochure is now available electronically! Dominican Get-togethers has been one of GFDD's most popular new initiatives in 2011 and in less than 8 months has succeeded in attracting hundreds of avid supporters from the Dominican Republic and beyond. These Get-togethers are organized primarily in the New York metropolis and will include areas with large Dominican communities throughout the U.S.A in the future. The Get-togethers introduce topics related to the Dominican Republic and allow guests to enjoy Dominican -or Dominican-inspired films, mingle with Dominican personalities and participate in debates about issues relevant to the Dominican Community. Over the course of the year, guests have included baseball stars, actors, entrepreneurs, community leaders, industry executives and mountaineers. The dates of the first Virtual Educa in a non-Spanish speaking country have been announced to take place February 29 - March 2, 2012 at the same the time as the Organization of American States ministerial and high authorities meeting. InteRDom, the internship and academic study program of Global Foundation for Democracy and Development (GFDD) and Fundación Global Democracia y Desarrollo (FUNGLODE), is pleased to announce that it will host the second biannual "InteRDom PRO: Professional Externship for Professors and Academics" in Santo Domingo, Dominican Republic from March 14-18, 2012.